JIU was founded in 1992 by the Josai University Corporation in the city of Togane, Chiba Prefecture, about 90 minutes from downtown Tokyo. Josai University Corporation was established in 1965 by Mikio Mizuta who was Minister of Finance for a total of twelve years starting in 1960. The university offers a four-year undergraduate program as well as a graduate program. There are five undergraduate schools or faculties: (1) Faculty of Management and Information Sciences; (2) Faculty of International Humanities; (3) Faculty of Media Studies; (4) Faculty of Social Work Studies; (5) Faculty of Tourism; and (6) Faculty of Pharmaceutical Sciences. There are four graduate schools; (1) Graduate School of Global Humanities; (2) Graduate School of Management and Information Sciences; (3) Graduate School of Social Welfare; and (4) Graduate School of Business Design. At present, the university has over 6,000 students, including the undergraduate student body and the graduate program. Many of the students come from various foreign countries. JIU offers a variety of courses on Japan; Japanese history, Japanese culture, Japanese art and literature. 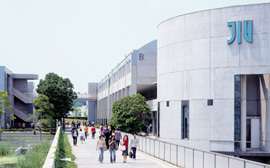 Courses are taught by experts in English and Japanese. JIU also offers Japanese language courses from basic to advanced, and advanced reading courses. Besides the international presence in our student body, the university faculty also mirrors the growing dynamic importance of "international" in Twenty-first century universities. Our teachers come from many countries and international backgrounds. In this way, the campus is a nexus of cultural exchange and awareness. JIU offers you not only a solid international education but also a variety of Japanese cultural experiences. You can join many of its extracurricular activities, such as ikebana, karate, Japanese tea ceremony (sado), judo, kendo, soccer, basketball, surfing and table tennis, along with many others. Some of JIU's sports teams are renowned in Japan for their consistently high national ranking. Students from overseas also can join the various student organizations to learn experience Japanese culture.